We’re getting our first views of Lion Preview 2 and contrary to earlier reports, this certainly doesn’t feel like a Gold Master. In fact, it doesn’t improve much from the previous preview in terms of stability –which is fine if we are a few months away. 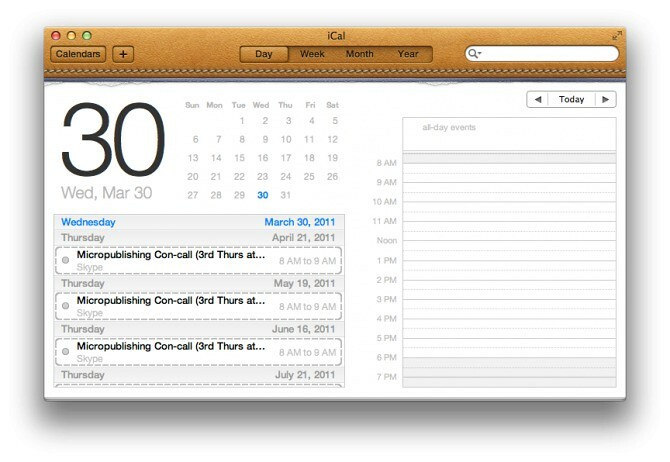 As you can see above, iCal has a new leather bound header (OMG) with faux stitching and interestingly, iChat’s main window houses AIM, Bonjour and Jabber contacts together like Adium. Also, the Chrome browser crashes pretty frequently for our review copy anyway. Developers, please post any additional changes you find in the comments.